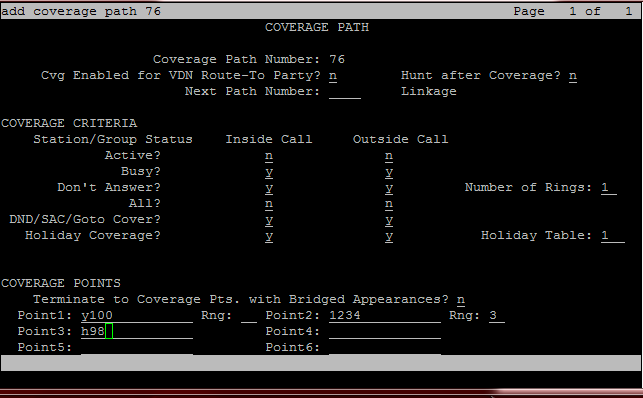 Apply Holiday Coverage to y on the inside / outside call as required. In the first coverage point enter y and either the extension number, announcement number or vdn number of where you want it to go to. You then move your 1st coverage point to point 2 and your 2nd coverage point to point 3 etc. How does it work when the holiday table is active it reads coverage point 1, when not it ignores coverage point 1 and goes straight to coverage point 2 and so on and so. 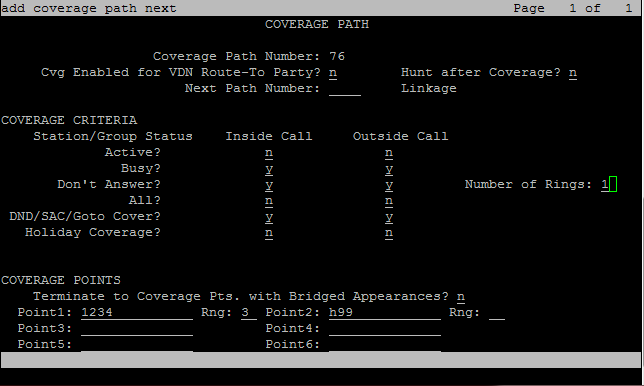 Example of typical coverage path; So in this is an example of a typical coverage path the coverage points go to an extension 1234 then hunt group 99.